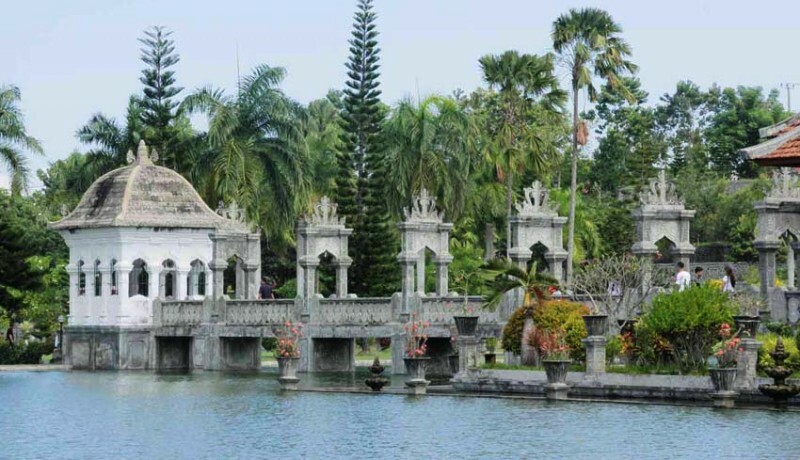 Taman Ujung Karangasem or also known as Taman Soekasada Ujung (Edge Soekasada Park) is a water palace that has a floating palace located on an area of more than 10 hectares in Tumbu Village, Karangasem Regency, about 5 km in the southeast of Amlapura. 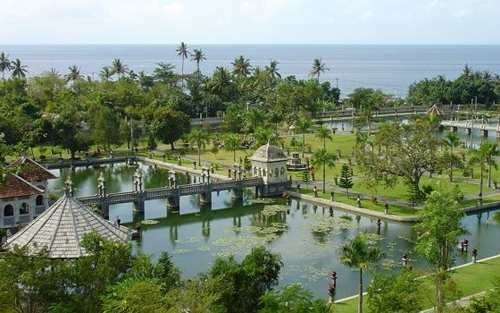 Taman Ujung Karangasem is a recommended place to you when you have a plan to marry. 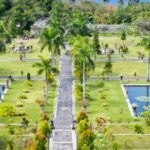 Yes, Taman Ujung Karangasem is good to have a pre-wedding! The physical features and a superb view of all area of Taman Soekasada Ujung, make it’s a favorite location for pre-wedding and artistic photographers. 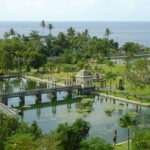 Taman Ujung Karangasem or Taman Soekasada Ujung was built by the King of Karangasem in 1919 and completed in its entirety in 1926 before Indonesia independent. 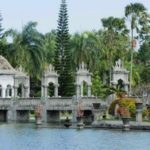 Taman Ujung Karangasem is a tourist destination in the East Bali region which was built since the Dutch era at the instruction of one of the King of Karangasem, namely I Ketut Gusti Jelantik. It called the Water Palace because water plays a very important role in this life, as 80% in the human body consists of water. In essence, life in this world cannot live well without water, especially according to the teachings of Hinduism that water is used to make holy water to cleanse the Bhuana Agung and Bhuana Alit. So that’s where Taman Soekasada Ujung is located in a lot of springs. That’s why the pools are sourced from freshwater springs as well as close to seawater. Seawater has a very large role to attract solar energy which will later be blown out through the wind towards the land to help life on land. That is why foreign guests who come to Bali are very happy to rest near the Sea. The geographical position of Taman Soekasada Ujung is near the sea. 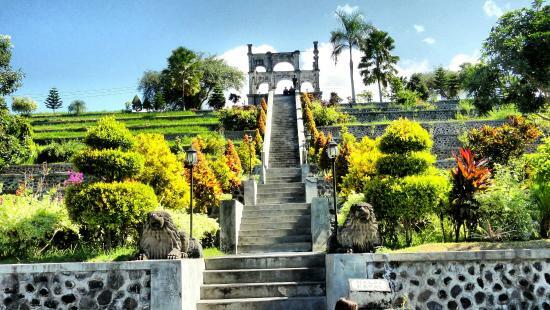 Taman Soekasada Ujung is one of the tourist attractions in Karangasem regency which has a unique and very meaningful history for the government of Karangasem regency, to be used as a basis for tourism promotion and gain knowledge of good leadership. The king who is very devoted to literary and religious teachings named Anak Agung Anglurah Ketut Karangasem as the founder of Taman Soekasada Ujung he is a writer, artist and also an architect. The King’s thinking to build this Park is to education or transformation from a leader to implement good governance. So the buildings built in Taman Soekasada Ujung are symbols of good governance taken from Nitisastra teachings. The water palace which has its own floating palace was built as a gift for the Empress. 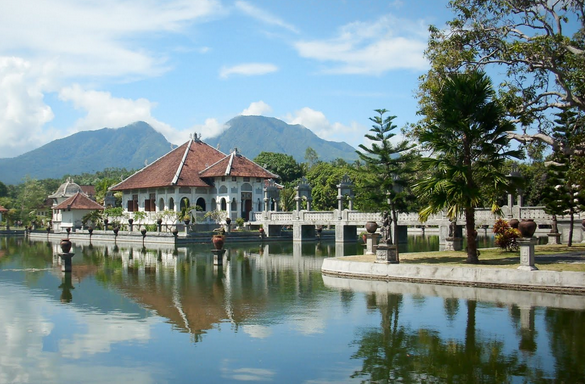 After having suffered severe damage due to the eruption of Mount Agung in 1963, the local government of Bali finally carried out a major renovation to rebuild the water palace as the original form. 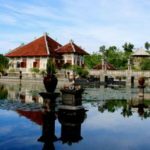 This renovation was completely completed in 2003 and finally officially opened as one of the mainstay tourist attractions in the East Bali region. 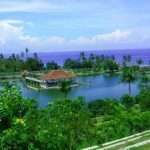 What’s offered by Taman Soekasada Ujung? 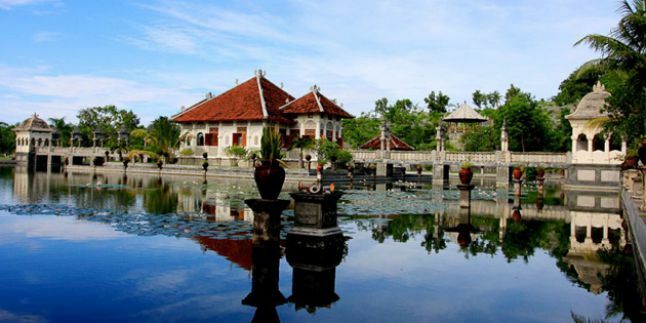 When visitors travel to Taman Soekasada Ujung it will certainly not be interesting if you just look at the pond. 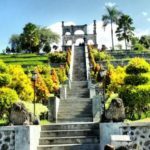 Go to up-stair and you will be mesmerized with the beauty offered by Taman Ujung Karangasem, you can see a pillar building without a roof. 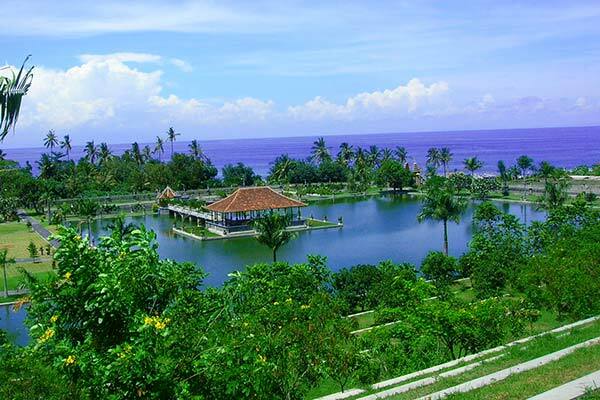 In the southeast area, you will be amazed by a magnificent view of the blue sea and Ujung Beach. And then in the east part, point your eyes down, you will be admired by the charming and uniqueness of Taman Soekasada Ujung architecture as a whole. 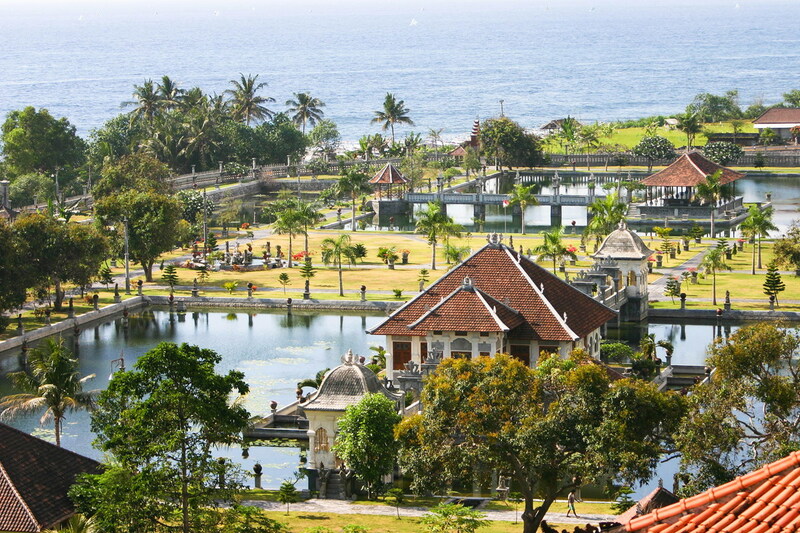 The Taman Ujung complex has a combination of Balinese, Chinese, and European architecture throughout three large pools connected by long elegant bridges and pathways. A prominent feature of European architecture is that there is a colorful glass decoration and this is found in the king’s resting room attached to the walls of the building’s walls. The decoration is more similar to the colorful glass decoration in the church. In addition, in the eastern part of Taman Soekasada Ujung, you will see a green hill, called Bisbis hill. 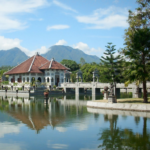 And in the west part, the wonderful view of Mount Agung will make you feel and said: “This is perfect!” All of part in Taman Soekasada Ujung will make you find the tremendous water palace, sister-site of Tirta Gangga Water Palace. In Taman Soekasada Ujung there are 3 spacious pools. One pool located in the south area and 2 other pools located in the north area. In the south pool, there is a building at the center of the pool, called “Bale Bengong”. This building does not have a wall. There is only a concrete pillar to sustain the roof of the building. 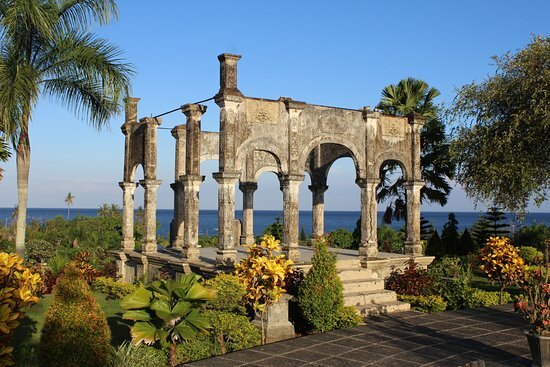 In the past era, this building was designated to serve a VIP guest in the Karangasem Kingdom. And then pools in the North area are bigger than the pool in the south area. At the center of the pool, there is a bridge to cross over the pool. 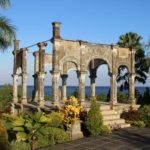 At the end of the bridge, at the center of the pool in the north area, there is a building that in the past era was designated as a place to rest for the king of the Karangasem Kindong. By the society, this building called by “Istana Gantung” or Hanging Palace because this building looks like hanging. Take a Good Opportunity To Find More Wonderful Experience In Bali!